You are here: Home / Brian Gale Surveyors / Interlocking Concrete Tiles or Clay Tiles? Interlocking Concrete Tiles or Clay Tiles? 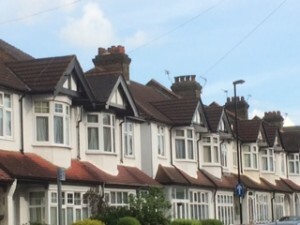 Whilst undertaking a Full Building Survey in the Croydon area we noted that in a terraced street comprising of 1930’s build houses, that the properties on the East side had mostly been re-roofed with concrete interlocking tiles yet the houses on the West side mainly retained their original clay tiles. There is no simple or single explanation for this. This can possibly be explained in relation to prevailing weather, usually from the South West, shortening life span of roof coverings, also frost action on damp North facing slopes causing “frost shattering“ of semi porous tiles .What we can say with regards to this is that generally clay tiles that are 80 years old will be nearing the end of their useful working life. Life expectancy of the roof could be prolonged by way of regular maintenance but if you are unhappy with this arrangement then a complete overhaul of the roof is the only option.